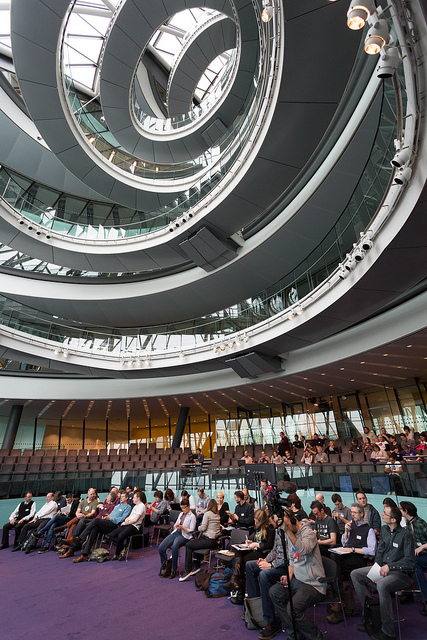 UKgovcamp14 took place at London’s City Hall last weekend — mySociety was one of the sponsors. It’s a great opportunity to meet people, many of whom are currently working inside local or national government, who don’t need further convincing that civic services can be improved by sensible use of well-designed online technologies. Furthermore UKgovcamp is an unconference, which effectively means people get to talk about what they really want to talk about, with a spontaneous agenda — ideal for sharing experience, suggestions, and enthusiasm. City Hall is an intriguing venue: it looks like a giant spacewoodlouse getting ready to pounce across the Thames onto the Tower of London. The main chamber has unnervingly clear accoustics (ideal for an event like this) and a history-rich view (HMS Belfast, the White Tower, and Tower Bridge); and we set our stall up on a floor that was tiled with — what else? — a huge, detailed aerial view of London. So this blog post is just a quick “hello” to all the people we talked to at the event, and a hearty “thanks” to the hard-working, grey-hoodied crew who made it all run so smoothly. Our Ben led a session at the end of the day on Open Standards. In the discussion that followed, we referred to two specific examples. When we built the new transcript tool SayIt, we decided it should initially work with transcripts in the Akoma Ntoso open standard for parliamentary documents — the SayIt site shows some examples of the subset we’re currently using. The point of course is not that transcripts need to be anything to do with parliament (see, for example, the plays of Shakespeare), but that the problem of structuring such documents has already been addresssed, shared, and adopted by others who happen to be in that field. The other example was the Open311 standard, which regular blog readers will recall from previous blog posts. We ended the day by getting soaked by an unexpectedly horizontal rainstorm the moment we left the sanctuary of City Hall’s glass carapace. Luckily we were able to dry out whilst continuing the networking in the pub just across the road. So, all in all, a splendid day.